This spicy recipe features Sriracha sauce (sometimes called "rooster sauce" because of the large bird on the label of the bottle), which is obviously not traditional. But the unique, smoky kick the hot sauce imparts is so flavorful you might not think of making it any other way. Although it was originally intended as a salad dressing, the best application of Russian dressing turns out to be on sandwiches and burgers. There's something about this tangy, piquant condiment that cuts through the heaviness of corned beef or a cheeseburger (or even French fries). With just five main ingredients, making your own Russian dressing is so easy, why settle for store-bought brands (if you can find them)? If spicy isn't your thing, you can eliminate the Sriracha from this recipe. 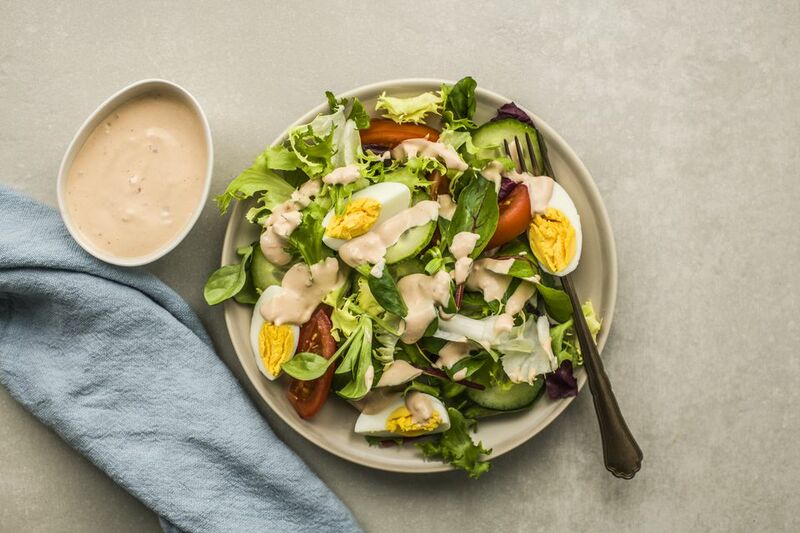 In a glass bowl, combine the mayonnaise, ketchup, half the horseradish, shallot, lemon juice, Worcestershire sauce, and Sriracha sauce. Taste and add additional horseradish as you deem necessary. Stir well. Cover with plastic and chill for 30 minutes before serving. Use on your salad or for your Reuben sandwiches and enjoy! The pinkish color of Russian dressing bears a striking resemblance to Thousand Island dressing (named after a large group of islands on the St. Lawrence River between the U.S. and Canada) but there are differences. Sriracha is the brand name of a hot sauce that has been around only since the 1980s. It was created by David Tran who had emigrated to the United States from Vietnam and settled in Los Angeles. The story has it that, unable to find a hot sauce that appealed to him, he started making his own and the brand was born and is now distributed by Hong Fuy Foods.